“ The more I fly, the more I'm convinced that the true wonder of modern aviation is the transformation of tasteless particles into something known as airplane food ”..
A lot has happened since 1919 when the first airline meal was served on a London to Paris flight. Today, in-flight catering is a 15 billion euro worldwide industry mainly under the control of two transnational companies, Dobbs of Switzerland and Sky Chefs of Germany. Together they cater the meals of 260 airlines around the world; just Sky Chefs alone prepares more than a million meals each day. Eating food at 35,000 feet of altitude is not the best idea from the physiological and nutritional point of view: according to a study by food scientists at the University of Reading in England, high altitudes dull the taste buds. In addition, taste and smell are affected because pressurised air in the cabin dries out the olfactory bulbs. The ability to taste salt and sweetness is reduced by at least 30% - yet overuse of salt may leave people dehydrated. Since the commercial jet interior altitude is as high as a mountain resort (around 8,000 feet above sea level), any food is hard to digest because of “intestinal swelling” produced by low air pressure while on board. The food you would like to eat at high altitude is the food that requires the least oxygen to digest. Carbohydrates provides quick energy and don't use as much oxygen. You only need small amounts of carbohydrates at high altitude. And what about the nutritional content of airplane food ? Truth is: airlines do not care about it and seems like neither do passengers. A recent survey conducted by a health and fitness network of in-flight meals from 15 airlines found that most meals are unusually high in fat and calories. Airlines surveyed included Northwest, United, US Airways, America West, Delta, Continental, TWA, Qantas, American Airlines, British Airways, Midwest Express, JAL, Virgin Atlantic, Air France, Lufthansa, and Virgin Atlantic. What they found is that the average in-flight dinner has about 1,054 calories, roughly the same as eating a Big Mac, medium fries and strawberry sundae at McDonald's. Furthermore, they estimated that the average in-flight dinner has 52 grams of fat - 8 grams more fat than a meal at McDonald's !!! Most airlines offer as many as two-dozen menu options for nutritional, medical or religious needs, ranging from low-fat/low-calorie, vegetarian, low-sodium, gluten-free, non-lactose, low protein to Kosher, Hindu and many more, but surprisingly, most airlines declared in this survey that they didn´t have enough resources to provide nutritional information on all the meals they prepare. No airline stood out in terms of offering very healthy or very unhealthy meals. In other words: It doesn´t matter in which airline you travel, there’s no escaping from the fact that once you’re 30,000 feet in the air, your intestine is being held hostage. But what if you decide to spend some extra money and go for first class service ? Well, if you think traveling first class is going to give you a break on calories or fat content, think again. As with coach class, the first-class menu selections have a wide variation, but consider for example this first-class dinner menu on Delta: filet mignon, traditional Caesar salad, whole-grain mustard sauce, roasted potatoes, green bean vegetable medley, organic rolls and ice cream with caramel or chocolate sauce, whipped cream and mixed nuts. That's a total of 1,829 calories, 72 grams of protein, 87 grams of fat and 197 grams of carbohydrate. Those are just about the whole daily requirements for an average adult but in only one meal. Your chances of ending up as bloated as the “Michelin man” are very high. Contrast that with one of the first-class selections on United, consisting of blackened tuna, basmati rice, Sicilian ragout, dinner salad with dressing, butter, olives, breadstick with margarine spread and a cookie. That's a total of 899 calories, 39 grams of protein, 29 grams of fat and 111 carbohydrates. The significantly lower calorie and fat content alone makes this a much healthier option. So, sometimes if you are lucky you can get a “decent” meal. 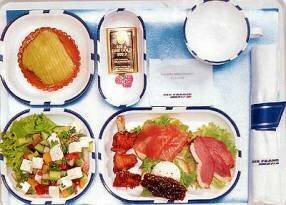 In general, European and Asiatic carriers offer better meals than American ones. Air France even gives a prestigious annual award to the airline with the “Best Food”. The high content of calories and fat may not represent a big problem for the average person who doesn't fly frequently, but for frequent travelers, it is a big deal. Researchers have identified several reasons for the increasing prevalence of obesity in Western countries, but one risk factor that has been overlooked for sure is frequent flying. Luckily, things are starting to change: while some American airlines and low-cost carriers in the UK and Europe have quit serving in-flight food altogether in order to reduce fares, some other major airlines are giving more and more attention to this matter by hiring nutritionists and chefs as advisors for elaborating their menus. Since 2001, the University of Surrey in England appointed the world's first professor of airline food, funded by a L500,000 grant from the International Flight Catering Association. Not only airlines are changing their approach, also passengers are paying closer attention to what they are eating. Recent statistics reveal that airline passengers are more concerned than ever with in-flight meals and how healthy they actually are. A recent survey from Sky Chefs, found that 76 percent of passenger thought food service was important on flights of three hours or longer. And 56 percent of the most frequent flyers (mostly affluent, college-educated males age 35 to 54) would make an effort to fly in an airline whose food service was rated superior. Perhaps most notably, two-thirds of respondents were concerned about getting healthy, high-quality food that is high in nutritional value and low in cholesterol and fat. What is the easiest way to eat healthy while you are in the skies? Simple. Don’t eat the airline food. Your best bets for eating healthy in the air include: eating before you board, bringing your own food or ordering the special meal ahead of time. Each option has its disadvantages but none are as bad as the nutritional nightmare of the regular in-flight meal. A Nutritional Analysis of an Airline Meal. La Puma J, Schiedermayer D.
Comfort and health in commercial aircraft: a literature review. Brundrett G.